On Monday, 12 July until 6 August, 2010, photo exhibition “Island 09, 10” by Ainis Rimšelis and Juris Mendziņš at Kim? study exhibition space mit. The exhibition showcases approximately forty works made in 2009 and 2010. The authors have tried to feel and document Ķīpsala as it is now and probably will not stay for long. 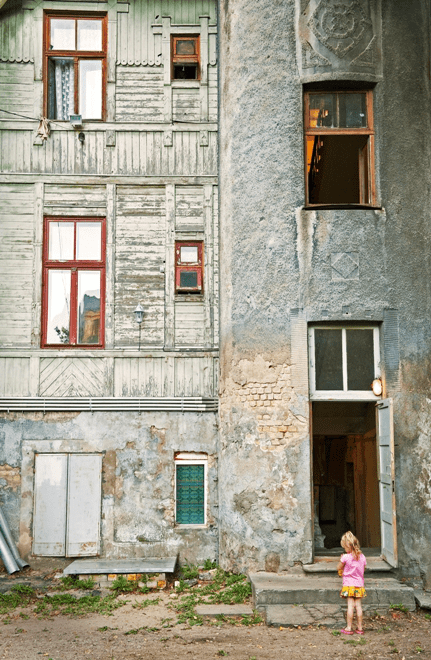 Ķīpsala is a peculiar place – an island located right next to the most advanced high-rise building belong to a bank in Riga, and only a few kilometres from the President’s palace. One part of the island’s population lives in old wooden houses with outdoor toilets, collect autumn apples in abandoned gardens, sip homemade vodka for 1.30, love and hate one another, sweep the streets and work in their little gardens. Ķīpsala is neither city centre, nor monotonous block of flats or outskirts – it is difficult to define what kind of place is Ķīpsala. Quite close to the constant traffic-jam on the Vašutilts (Shroud bridge), old Ķīpsala unhurriedly leads its life and does not seem to care about the stress outside its territory. Haste-free island. Capitalists also like Ķīpsala. Thus Ķīpsala is a combination of new, modern and old, worn and tidy, sterile and utterly squalid, rich and modest. Well, the opposites are not ready for close encounter that is why Ķīpsala has many fences. Everyone has an island of one’s own. Ķīpsala is changing. The prosperous Ķīpsala extends its living space block by block, currently leaving the space between the Factory Restaurant and hardware store to the old Ķīpsala. Old islanders do not pay much attention to it, and settle elsewhere. Or leave altogether. This perishing, old Ķīpsala captured the author’s attention. The patron of mit is advertising agency DDB Worldwide. The everyday life of the photographers is also associated with advertising and media world: Ainis Rimšelis is the Director of information and advertising agency “BTR”, while Juris Mendziņš is the Chairman of “Delfi”. The authors wish to express their deepest gratitude to their teacher photographer Gatis Rozenfelds.